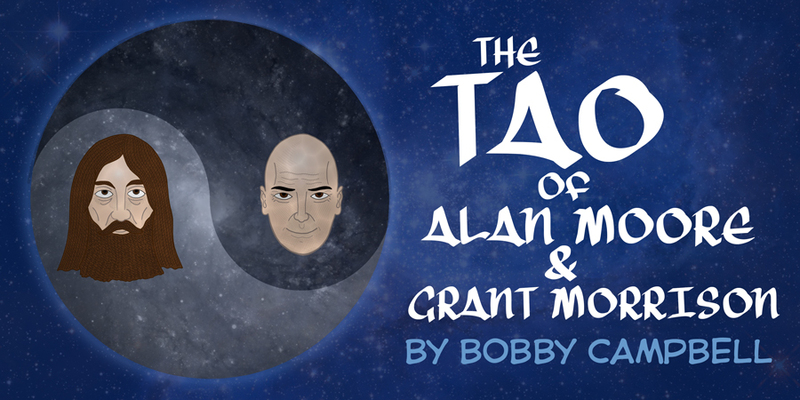 I have something of a fascination for the recurring manufactured drama between comic/occult/visionary writers Alan Moore & Grant Morrison. Often times billed as an epic magickal war, w/ thematic shades of Aleister Crowley vs. William Butler Yeats coloring the contextual landscape, this imaginary battle persists through ideaspace, converging into a mythic hypercontextual metanarrative. My all time favorite writer is Robert Anton Wilson, the iconoclastic, psychedelic, futurist, occultist, agnostic-mystic, who seems in many ways to have prefigured the likes of Moore & Morrison. Both AM & GM have professed admiration for RAW, and I tend to see their conflict in terms of each wanting to occupy the same role as the successor to Pope Bob’s illuminating, cosmic triggering, tale of the tribe. The Merlinesque sage. Though I doubt it’s actually that specific, and both AM & GM have surpassed RAW in fame & fortune anyways, but I certainly do think that both are trying to fill the same niche, preach to the same choir, and have misgivings about whether or not the town is big enough for the both of them. I used to think that this was some sort of unfortunate state of affairs, the world’s 2 greatest magi, who should have so much common ground, engaged in petty dispute. Their egoless cosmic wisdom deployed in service of “well, he started it!” Though I’ve come to see this antagonism as a perfectly natural consequence of a metaphysical duality. 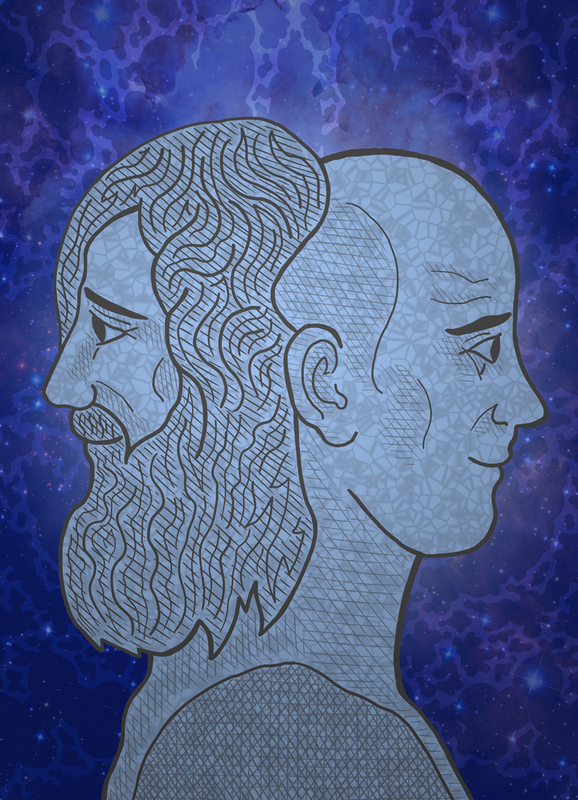 They seem to me to be two sides of the same coin, a janus head locked in a discordian entanglement, the diametrically opposed Hodge & Podge of the Erisians’ Sacred Chao. 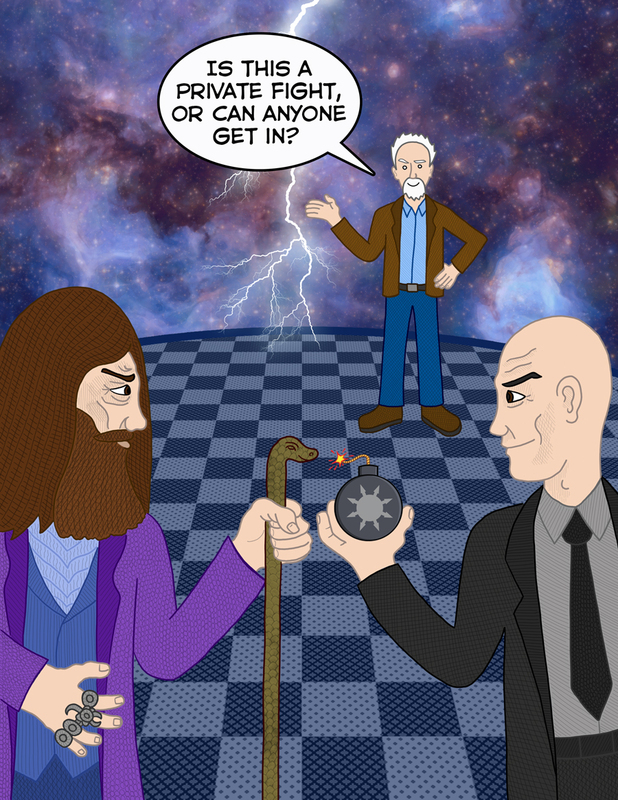 Their duality is explicitly evident even in just the plain fact of their contrasting visages, the mythically shaggy Alan Moore and the gleamingly shorn Grant Morrison. Though perhaps their oddly iterative surnames are the more obvious tell? 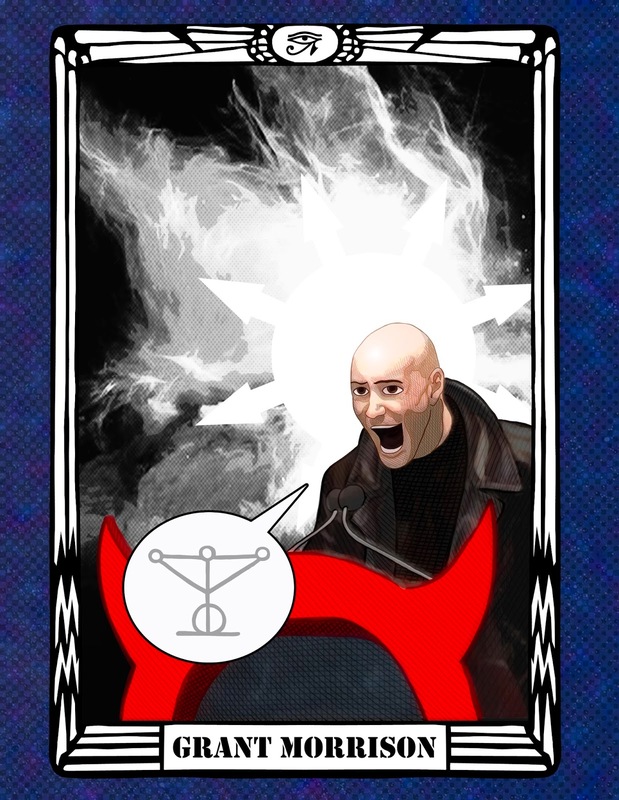 I suppose now is as good a time as any to mention that the word “Magis” is a Latin word that means “more.” Though this interconnection goes well beyond mere superficial coincidence, and seems to permeate their creative personas and great works. On the one hand we have the principled and incorruptibly working class Alan Moore, who has been unable to get Hollywood to stop turning his stories into movies, no matter how much venom he spits their way, and on the other hand, we have the stylish and glamorous pop art star Grant Morrison, who despite his great enthusiasm and full cooperation, has yet to see a mainstream adaptation of his work hit the big screen. Moore seems furious at corporate media for their exploitative and manipulative business practices, rightfully so, whereas Morrison seems giddy w/ his opportunity to exploit and manipulate the global reach of corporate brands to broadcast his idiosyncratic ideas, also rightfully so. Morrison for his part seems somewhat aware and encouraging of the view that he and Moore are a dichotomous pair, as evidenced by his description of their contrasting approaches to the superhero genre in his book Supergods, comparing Moore’s approach to that of a missionary and his own to that of an anthropologist. Though this is a critical comparison that naturally favors his own style, there is an element of truth to how each writer has handled the unreality of the genre. Moore’s superhero work was deconstructive in nature, bursting the bubble of these adolescent power fantasies by bringing real world logic to these imaginary worlds. Moore’s approach was to make the superhero genre more like the real world, where absolute power corrupts absolutely, and the concept of heroism is ambiguous at best. Moore brought superheroes to their logical conclusion, and having brought them to their end, saw little use for them moving forward. Morrison’s work is a contrary reaction to this take on superheroism, which embraces a more idealistic perspective, and attempts to bring the wondrous surreality of these fictional universes into our own. Instead of making the Superheroes more like us, Morrison wants to make us more like the Superheroes, crafting aspirational and provocative stories meant to transform the reader into self actualized super beings. 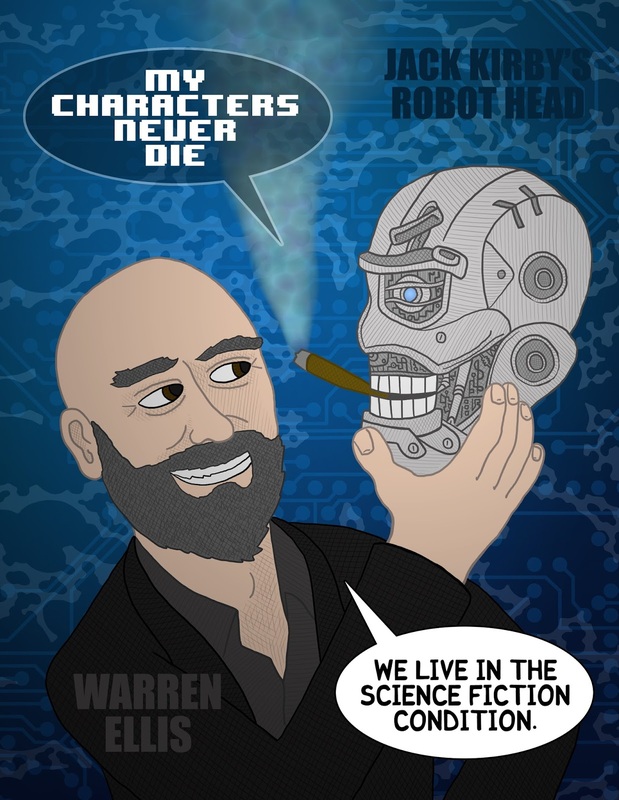 Also, and of course, the synthesis of AM’s thesis & GM’s antithesis would be the bald headed & bearded Warren Ellis. 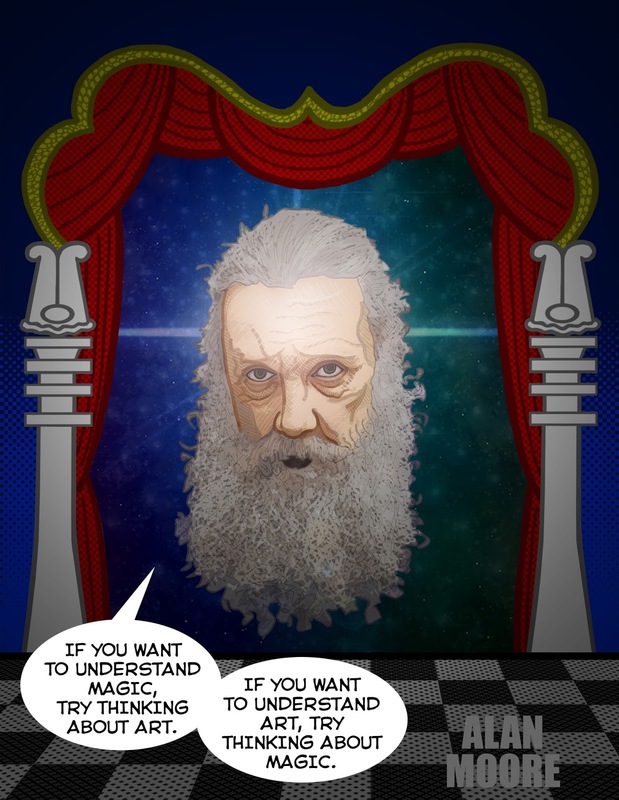 and Alan Moore in old age. Up, Up, Up, and Away Now!